Thanks to the California Conservation Corps crew members for all their hard work gopher-proofing and cleaning up the Mendocino College Preschool Garden! It was a beautiful fall day. Keeping the gophers and other burrowing critters out of the garden beds will definitely allow the preschoolers to see the fruits of their garden labor!! How to gopher-proof you ask? We dug out the raised beds, laid in gopher-wire metal mesh, and nailed it to the bender boards 3 - 4 " apart. We then filled the beds back in with a mixture of the original soil and compost. In addition to keeping the gophers out, this work helped aerate and add important nutrients to the soil. Interested in volunteering at workdays like this? We are often asked, "How many Gardens do you have?" 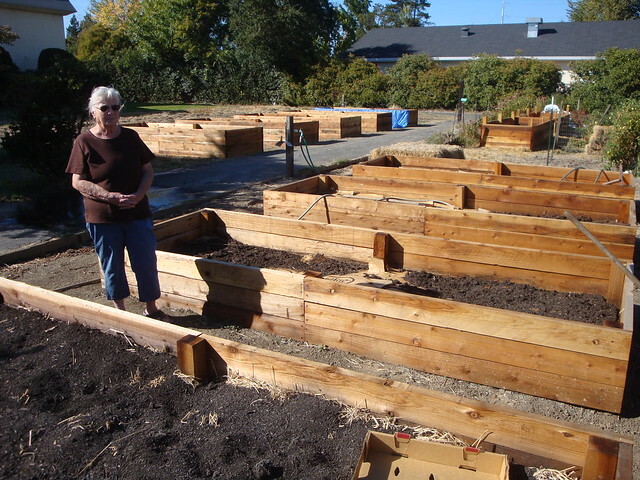 However to this date, the Gardens Project has facilitated the development of 34 community gardens in Mendocino and Lake counties. 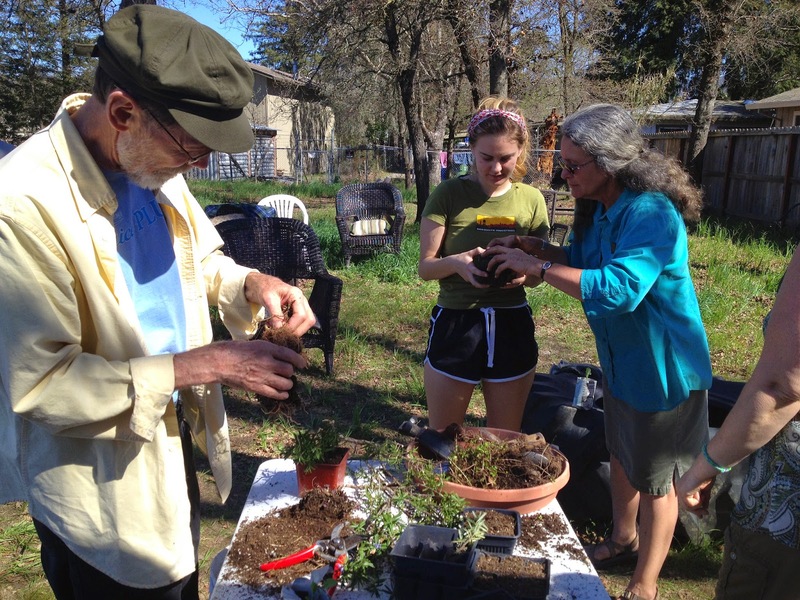 Just in the past year, we've developed two new community gardens in Ukiah, hosted leadership development training for gardeners, updated and expanded the capacity of several existing gardens, and strengthened partnerships with many. Here's a summary of all the fun we've had in the last year! 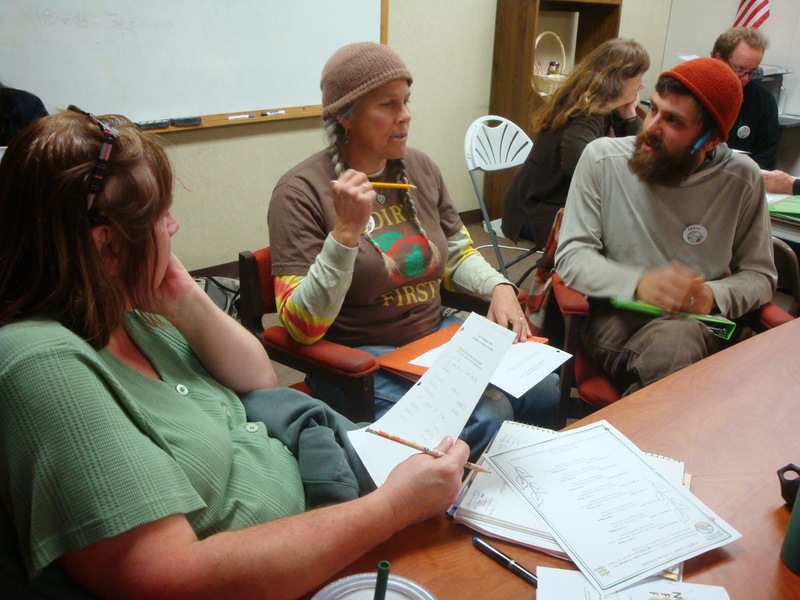 Coastal Garden Leaders at their first meeting in Janurary 2014, they graduate next month! Over the last three years, we've trained 60 gardeners in Mendocino County to become leaders for their community gardens, increasing the sustainability of gardens and building community. Since January, we've worked with 20 of those leaders of on coast, and a group of leaders in Willits from our 2013 training have continued to meet. The Willits leaders hosted a garden tour on August 25th. The capstone project of a year long leadership training is the Photovoice Project. Participants take photos from their gardens and add captions to capture aspects of their garden experiences to share with community members and policy makers. Click here to view Photovoice Projects. 20 new raised beds were created in Early Fall 2013 for Autumn Leaves. The Gardens Project partnered with and the Pinoleville Pomo Nation YouthBuild Program to create the raised beds. North Cal Wood Products donated redwood and Cold Creek Compost donated compost to fill all the new beds. All three have donated their time and resources to many other gardens working with the Gardens Project. See all the photos of the beds being constructed by these resourceful youth at our Autumn Leaves Photo Album! Vinewood Park at the Peak of the Season! Vinewood Park Community Garden is a collaboration between the City of Ukiah and The Gardens Project. The Garden is located along the North end of the park, along the fence line in an area previously underused and covered in ivy. The garden provides 12 wheel-chair accessible raised beds serving the Walnut Village Senior Apartments as well as 16 additional beds for neighboring families and individuals. Pinoleville YouthBuild, our most valuable partner in garden construction, built the fence, raised beds and communication board for the garden. See more pictures of the garden! Village Circle Community Garden was developed in partnership with private land owners. 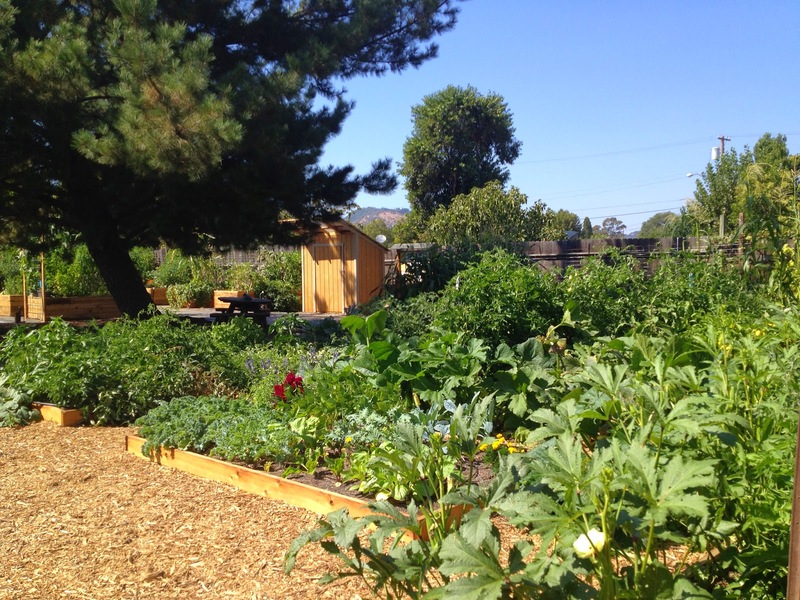 This garden is one of the largest community gardens in Ukiah with 49 plots, second only to the State Street Garden which currently has 54 garden plots. Gardeners from the Cleveland Lane Community Garden have transitioned to this new garden in preparation for their garden closing due to expansion of the Grace Hudson Museum. Directly south of the garden are the Summer Creek apartments, who's residents are also participating in the garden. Thank you to Jason Dolan and Dark Horse Farming Company for providing labor and materials for the fencing, and also Ukiah Natural Foods for awarding the Gardens Project with a $2,000 grant to purchase fencing. Tons of information for gardeners to see on the new boards. 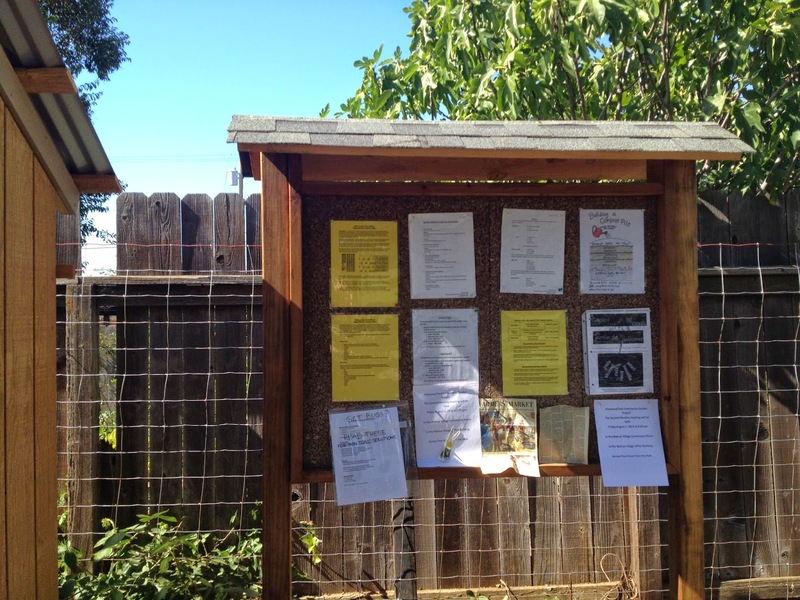 Five boards were created for gardens to post communications, gardening information by the students of the PinolevilleYouth Build Program. Starting in Janurary 2014, the Gardens Project started a series of workshops that take a new gardener step by step through the gardening cycle. We are so thankful for all of our workshop presenters, and are looking forward to the ones still to come! The 92 senior residents of Autumn Leaves Senior Apartments in Ukiah now have 20 beautiful raised beds to make their garden more wheel-chair accessible. The avid gardeners at Autumn Leaves saw the need to have raised beds so that all residents could participate in growing their own food in more easeful way. The garden at Autumn Leaves has been around for many years, but focus in the garden has changed over time. Jerrie Woodward, a resident of Autumn Leaves of four years, has had a garden all her life. She said that before she lived there, most of the gardeners used the garden produce for just their families. Now, Jerrie and another woman of Autumn Leaves focus on producing a lot of food to give back to the 92 residents living there. 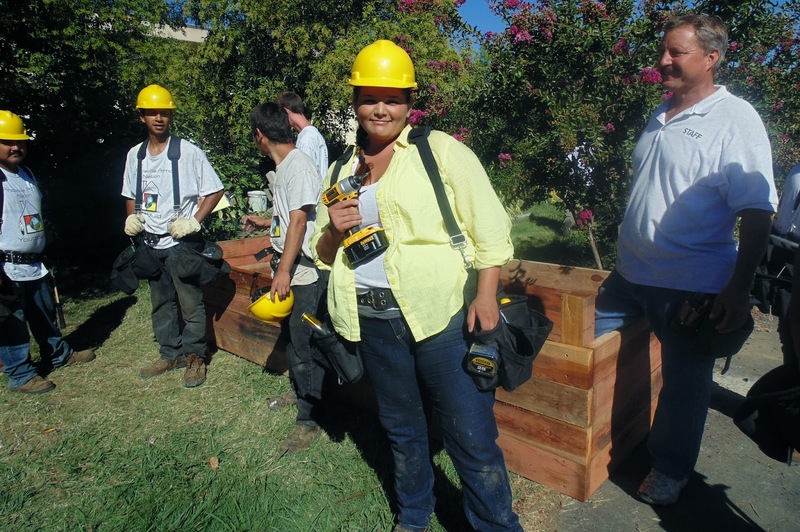 The Gardens Project partnered with and the Pinoleville Pomo Nation YouthBuild Program to create the raised beds. North Cal Wood Products donated redwood and Cold Creek Compost donated compost to fill all the new beds. All three have donated their time and resources to many other gardens working with the Gardens Project. See all the photos of the beds being constructed by these resourceful youth at our Autumn Leaves Photo Album!